I stayed at the Barbarella Suite in the UNESCO historic center. You have many hotels in Naples to choose from, for every budget. 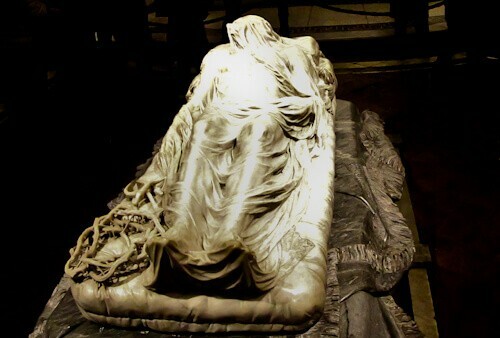 One of the masterpieces of the world is the Veiled Christ marble sculpture by Giuseppe Sanmartino. It represents Christ in death covered by a shroud. At his feet lay the crown of thorns and his shackles. There is an eerie life like appearance to the sculpture. In addition, from the perspective of a photo editor, this photo edited differently to any other photo I’ve ever edited. The Veiled Christ is located in the Sansevero Chapel. As well as the Veiled Christ, the ceiling of Sansevero Chapel is considered to be a masterpiece. The artwork on the ceiling is ‘The Glory of Paradise’ painted by Francesco Maria Russo. The real shroud which covered Christ is in nearby Turin. 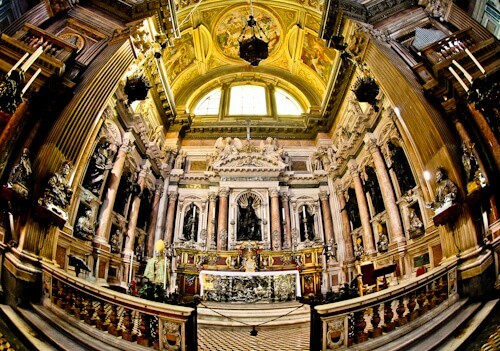 Naples Cathedral is different from the cathedrals of Milan and Florence. Firstly it’s peaceful and secondly, it has free entry. It may not be as beautiful as the other cathedrals but it has something inside that the others don’t have. Inside the cathedral is the blood of Saint Januarius. The dried blood is brought out twice a year, in May and September. The blood will liquefy on these days. On the contrary, if the blood does not liquefy, legend has it that something bad will happen to Naples. Additionally when Pope Francis visited in March 2015, the blood liquefied. I’d like to think when I visited that the blood also liquefied. Unfortunately it’s not on display so I’ll never know! 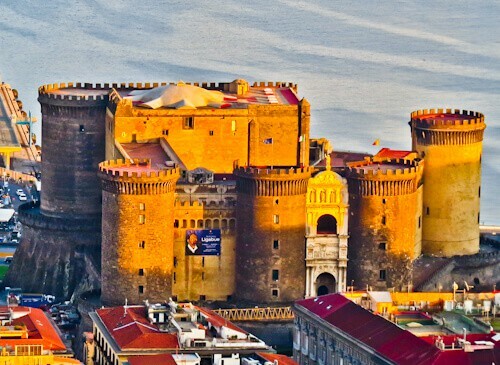 Castel Sant’Elmo is a medieval fortress overlooking Naples. To reach the castle, you have the choice of a 20 minute walk up steps or a short funicular ride. It’s free to enter the castle grounds and of course you get a wonderful panoramic of the city. 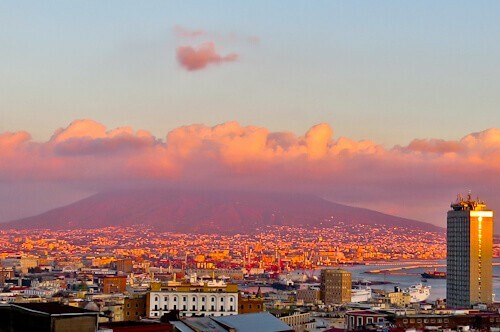 In addition you’ll have a panoramic over the bay of Naples and Mount Vesuvius. I recommend you watch the Naples sunset from the castle. On the edge of the historic city is the Medieval Castel Nuovo. 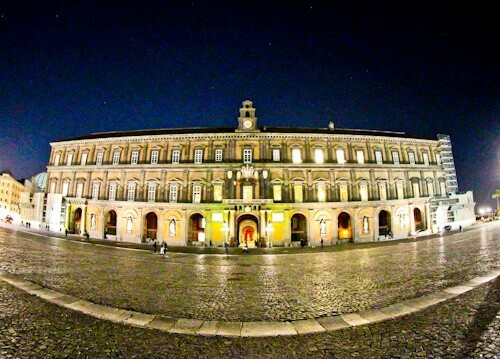 It was built in the 13th century for the royal family of the Kingdom of Naples. They required a castle by the sea. In the 15th century a white triumphal arch was added to the castle. This is situated between the 2 western towers. It’s possible to visit the castle, it houses an armory as well as artwork. Spaccanapoli is Italian for ‘Naples splitter’. It’s the main street that runs through the historic center. Spaccanapoli is best viewed from Castel Sant’Elmo, you can clearly see it splitting the city (above). On this narrow street you’ll find kiosks selling local food in addition to the cafes and souvenir stores. The Royal Palace of Naples is located on Piazza del Plebiscito. Naples used to be the capital of the Kingdom of the two Sicilies. This kingdom made up the southern part of modern day Italy. During this period, the Bourbon Kings would reside in this palace. Directly opposite the palace is the San Francesco di Paola Church. 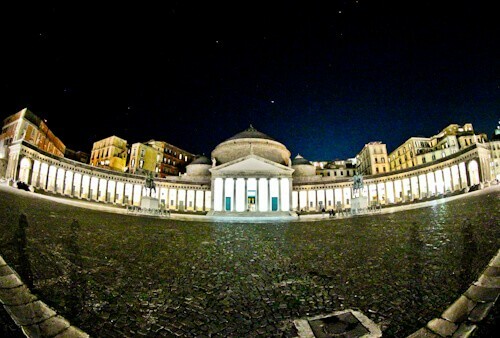 San Francesco di Paola church is the iconic landmark of Naples. You’ll see it on most tourism brochures etc… Its central dome is reminiscent of the Pantheon of Rome. The church was originally designed by Napoleon’s brother in law as a tribute to him. During construction, Napoleon was removed from Italy. However, the King still finished the project. They dedicated the building to Saint Francis of Paola and it became a church as oppose to a tribute to Napoleon. Galleria Umberto I is just as beautiful as the more famous Galleria Vittorio Emanuele II in Milan. For me it’s preferable to Milan because there aren’t thousands of tourists taking selfies inside. 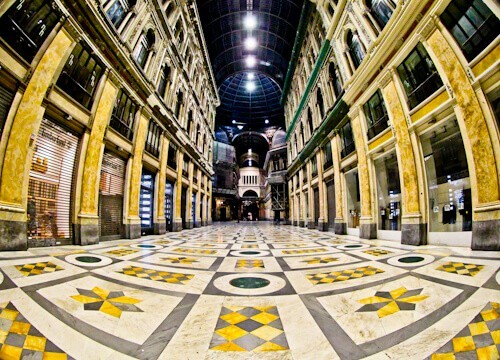 It was built about 10 years after the shopping gallery in Milan. The designer, Emanuele Rocco was heavily influenced by the design of the Milanese version. No trip to Naples is complete without a visit to Mount Vesuvius. This is the famous volcano that destroyed ancient Pompeii and Herculaneum. It’s a decade volcano, one of the deadliest on earth. The reason it is so dangerous is because it’s so close to Naples. Read about my day trip to Mount Vesuvius using public transport. Ancient Pompeii is famous worldwide as the town Mount Vesuvius destroyed. 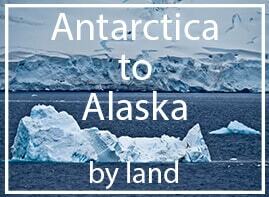 So many movies have been made about this destination. Today Ancient Pompeii is the best preserved Roman city in the world. As a result of Vesuvius burying it in lava, it was preserved. 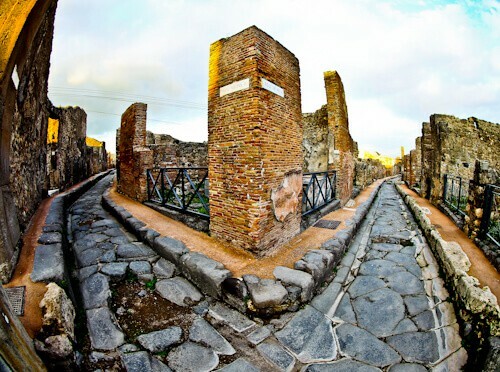 Today you can walk the streets of Pompeii, visit the amphitheater and forum. Additionally you can visit houses and see preserved frescoes and garden features. 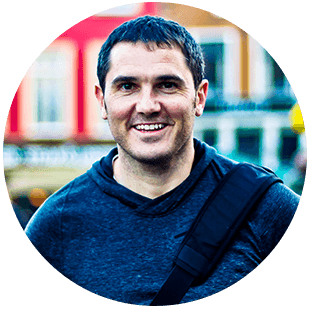 Read about my visit to Pompeii. Football fans or anyone looking for a unique experience can visit Stadio San Paolo. 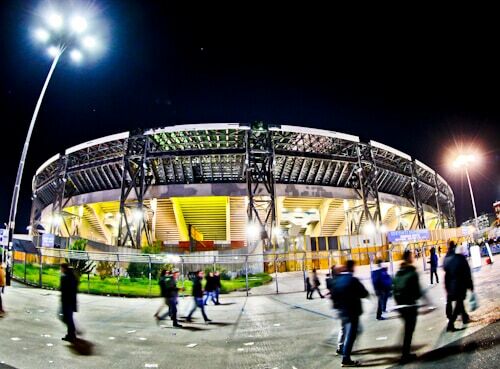 This is the home of top Italian football team, Napoli. It’s very likely there will be a football superstar playing. Additionally, for those who want a more historic experience, there’s a well preserved Flavian Amphitheater nearby. 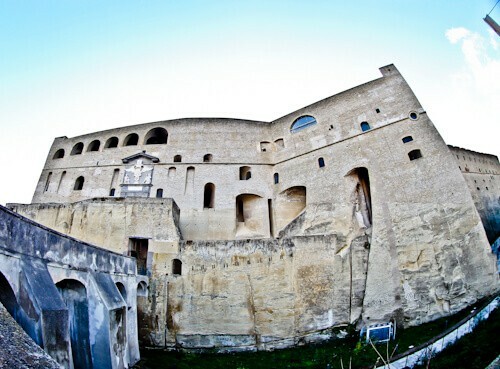 Located in Pozzuoli is the third largest amphitheater in Italy. Read about my Napoli match day experience here. For many years, Diego Maradona played for Napoli football club. You will see his name and merchandise for sale as you walk around the city. Located on Spaccanapoli is a cafe called Bar Nilo. 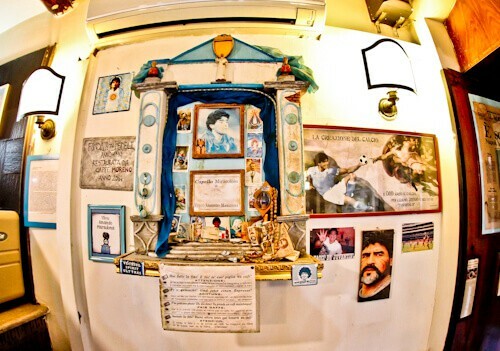 In this cafe you can see a shrine to Diego Maradona. Whether you’re a fan or not, it’s worth a look. You should enjoy an espresso whilst you’re in there! 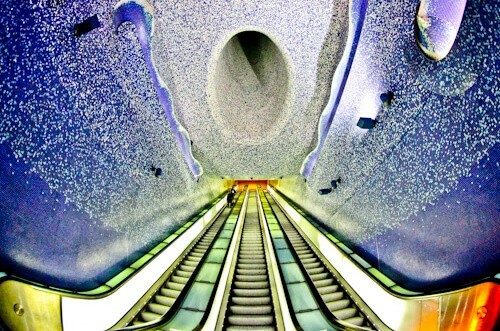 Even if you decide to walk Naples on foot, you should make your way down into the Metro. Toledo station in particular is worth a visit. It is described as a new art metro station. I would describe it as an Instagrammable metro station! If you need an excuse to visit you could get on the metro at Toledo before changing at Museo on your way to Pozzuoli to see the Flavian Amphitheater. The easiest way to get to Pompei from Naples is by the Circumvesuviana train. You take the train in the direction of Sorrento from Porto Nolana station in Naples. It takes around 30 minutes to reach Pompei. The station you get off at is Pompei Scavi. The Veiled Christ statue is so life like! It’s kind of eerie that it edited differently to other photos. I’d definitely go up to the castle for a sunset over Vesuvius! Hi Joey, the veiled Christ is a must see, the detail is amazing – down to his veins! 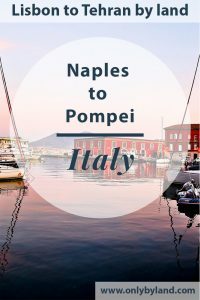 Wow, there is so much to do in Naples! I only knew of the football stadium. The story about the blood made my hair stand on end! Also about the Veiled Christ – what a destination! These Italian cities are full of history – such interesting places to visit. 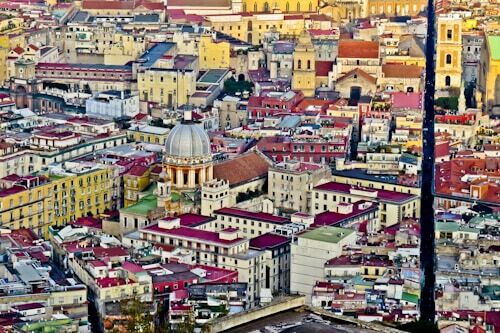 Naples i a must visit!